This is such a delightful chicken; thanks so much for sharing your chart! I have just cast on to make one; I hope it turns out half as well. 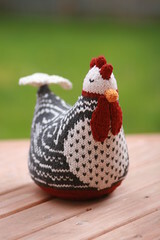 You can buy the pdf of the chicken pattern off blue sky alpaca’s website now. Thanks for the chart! How did you make it? Do you have some kind of software or something for that purpose? Cool, that’s good to know! Ooh, this is really wonderful! Thank you so much for your generosity in sharing the colorwork chart for your chicken. You did an amazing job with the evocation of feathers. I will be watching your projects on Ravelry for future innovations. Thanks for sharing! This chart is a modification to a separate pattern. 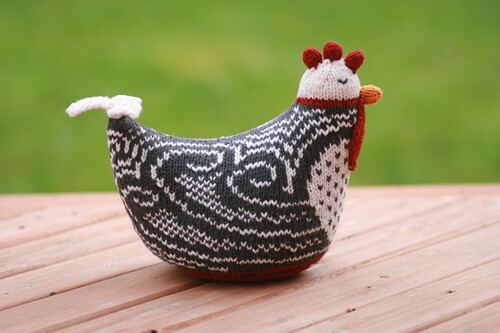 You\’ll need to buy the Blue Sky Alpacas "Knit Chickens" pattern to make the chicken itself. You use all of the instructions from that pattern, except instead of doing stripes for the body, you knit this chart.To my knowledge, the chicken pattern is only available in printed form. You can get it from an LYS or have it mailed to you from an online store. You can find a list of Blue Sky retailers through the link in the notes. hey.. this chicken is soo cute! im sort of a beginner, so are there any notes about how to make the head and tail and stuff? Wow you made a Plymouth Barred Rock or is it a Exchequer Leghorn or a Cuckoo Maran or a black and white cochin? What variety inspired you?